Table: Where data is best represented as a table (multiple data points relating to each other), the featured snippet will often be shown in the form of a table. Note, however, that for a table snippet to appear, it virtually always has to be coded as a <table> in your HTML. 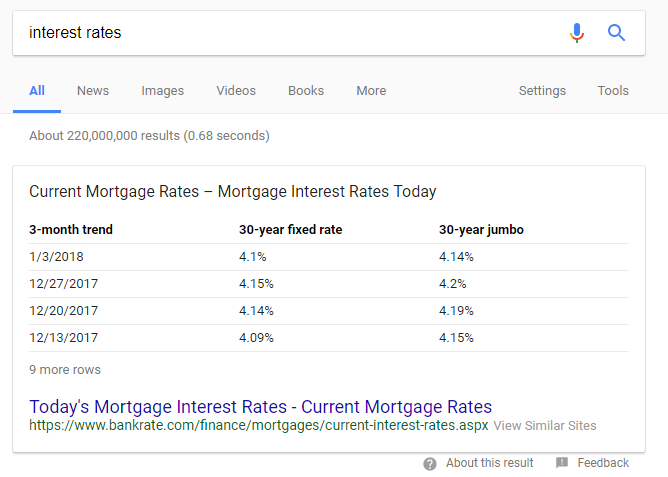 According to Rob Bucci of STAT Search Analytics (https://getstat.com/), subjective searches like the “top” or the “best” of something most often trigger table featured snippets. Currently, 29% of all featured snippets are tables. How can I optimize for featured snippets? When Google decides to show a featured snippet, it is attempting to show the “best” answer for that question on the web, which is not always the site that ranks number one in the organic listings. 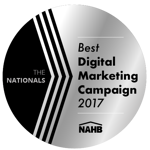 In many ways, there seems to be much more emphasis on the nature of the content and how it answers the question than on external signals like links. Repeat the question that is the query, or that is implicit in the query, clearly and prominently on your webpage. Provide more information, data, images, etc. to answer the question as fully and completely as possible. Make your page easy to navigate for both search engines and users, and make the information easy to find. Minimize “distractions” and information that is off-topic, and generally practice good user-centric design. Focus on presenting the most clear, concise, and thorough answer for the question posed by the searcher. One way to think about presenting your content is what journalists refer to as “the inverted pyramid.” This format has been proven to be useful and compelling for users, and it has the added benefit of making your content more likely to be chosen as a featured snippet. Present the most important information that answers the question first; then supplement with more detailed information; and follow up with richer, deeper, more varied information about the topic. Summarize the answer to the question in a single paragraph. Format that paragraph with a paragraph HTML tag <p>. Place that paragraph directly below the heading for the question. Make the answer paragraph roughly 40–55 words. While not absolutely necessary, formatting your list of steps, or list of answer/examples, as an actual list using <ol> and/or <li> tags in your HTML can be helpful. If not using those tags, try using headings (H2, H3, etc. tags) to make it clear that the information in each section is step one, step two, step three, etc. or option one, option two, option three, etc. Presenting your content in a question-and-answer format or as a list of frequently asked questions can also help the engines detect a specific short answer to a question. You can help increase your chances of showing up as a featured snippet by presenting your data in a table, but remember to code it as a good old HTML table <table> to make it easy for Google to understand how the information should be provided. Currently, featured snippets are powered far more by the quality of the answer and a presentation that is easy for Google to understand. Links seem to matter far less than ranking in the organic search results — some featured snippets do not even come from the first page. However, first-page results more commonly appear as the snippet. Once you are able to rank on the first page for a particular search query, how the answer is presented (as noted in the content section above) seems to be much more influential than the overall link equity of the page. These metrics help Google know if content on that page is useful enough to truly answer the user’s query and to prevent the need to look at another site to get an answer. How do I find featured snippet opportunities? There are lots of different ways to find opportunities to show up as a featured snippet. In general, of course, you want to think about the types of queries that could trigger the featured snippet. One of the ways of amassing a list of keywords with potential to have featured snippets is to do good old-fashioned keyword research with one of the many popular keyword research tools. This will help you create a basic list of keywords to start with. There are several rules of thumb (which don’t always apply) that can guide you to which terms may have featured snippets. Higher-volume terms get snippets more often. Local intent queries very infrequently get featured snippets (pizza, plumber, etc. ), and in virtually no case does a featured snippet and a local pack appear on the same search engine results page. Note that this doesn’t necessarily apply when searching for a query that applies to an entire region rather than to a specific local business (e.g., "new homes in Phoenix Arizona"). Longer queries, especially those that are 6+ words, tend to show featured snippets more often (but not exclusively). Focus your keyword research on longer who, what, where, when, why, how queries and others with implied questions (does, causes, definintions, costs, etc.) and including action words (becoming, doing, getting, making, forming, cooking, etc.). While the types of queries are generally “question” type queries (who, what, where, why, when, how), that isn’t always the case. In many cases a question can be inferred from the search query, as shown above in the query “email marketing.” In that query Google is inferring that the user is looking for a definition of email marketing. 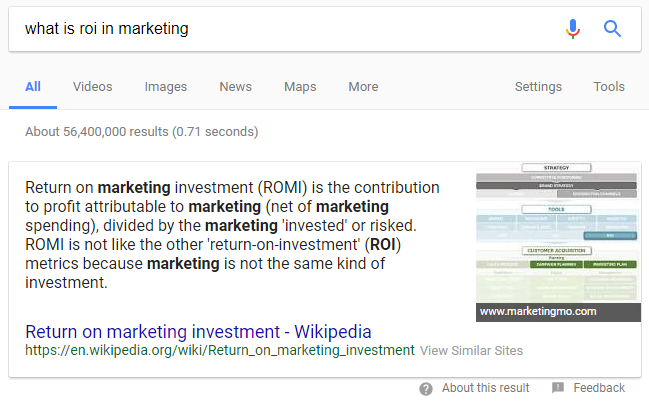 In that example you may have noted that while “what is roi in marketing” returns a featured snippet, it also returns a related questions, or “people also ask,” section on the search engine results page. For a query that returns a featured snippet, it is quite likely that the “people also ask” questions will do so as well. 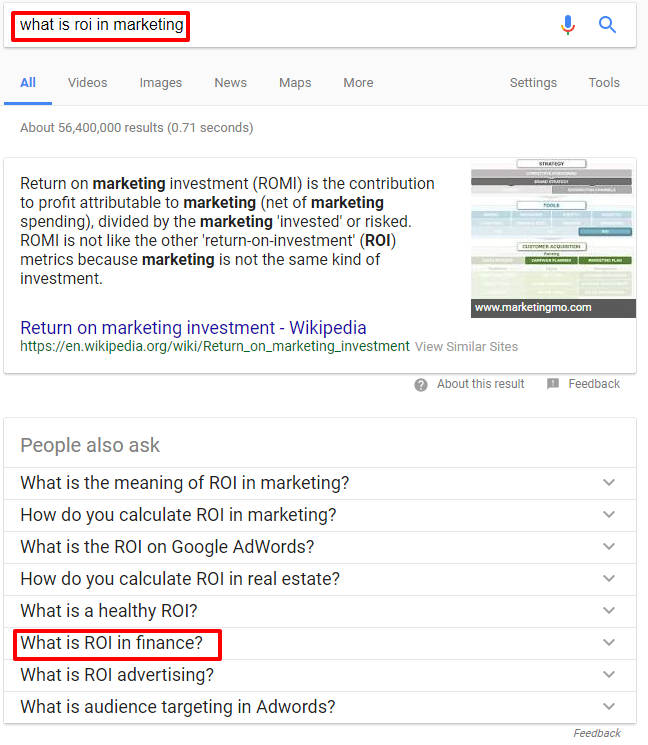 Note that a “people also ask” question for “what is roi in marketing” is “what is ROI in finance?”. 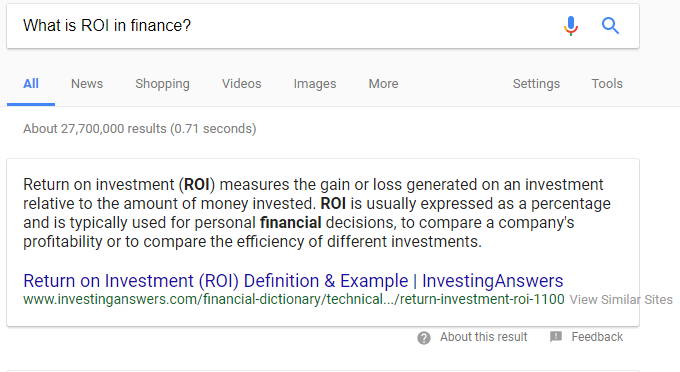 Clicking on that related question brings up a search engine results page that also contains a featured snippet that answers that question. By exploring keywords related to your site, you can start to build a list of questions and related questions (search queries) that return featured snippets. You can further drill down into the specific questions asked with each question modifier. The example below shows the common “how” questions around cooking turkey. 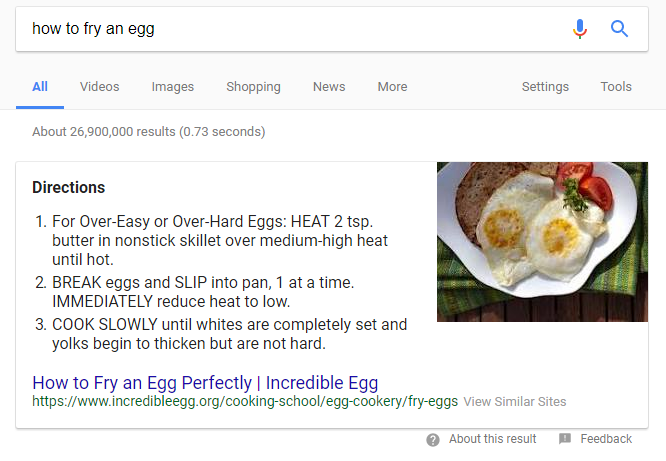 When we try the search query “how to cook turkey in an electric roaster,” it returns a featured snippet. While you can check each of these manually, AnswerThePublic also allows you to export lists of questions to Excel that can then be uploaded to a keyword research tool like STAT Search Analytics, which will show you which terms return a featured snippet on their search engine result page. There is quite a bit of outdated information on the web as to how to find featured snippets using SEMRush. 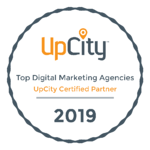 It used to entail brainstorming queries for either your site or your competitor’s site that might be likely to return a featured snippet, checking their rankings, and looking at the individual search engine result page one by one to see if a featured snippet existed. Luckily, SEMRush has now made it infinitely easier to find your featured snippets. This method works equally well whether you are looking at the keywords for which you currently rank, or those for which your competitors currently rank, for a featured snippet. Open SEMRush and input the domain you want to gather featured snippet data for, then navigate to the Organic Research option under the Overview section. Select the Positions option under Organic Research. If you wish, particularly if you want to apply multiple filters, you can filter the list of keywords under Advanced Filters by clicking Include> SERP Features> Featured Snippets, or you can simply select the “Featured snippet” link under the “SERP Features” list on the right-hand side of the page. This will then give you a list of all of the terms for which that site owns the featured snippet position. You can look at each individual search engine results page by clicking on the SERP link for each keyword, but far more useful is the ability to export the entire list to Excel. You can then input these lists into a tool like STAT Search Analytics to monitor both your featured snippet rankings and those of your competitors on an ongoing basis. Once you have begun to dominate the pages for which featured snippets currently exist you can begin to think about where they may exist in the future. Look at all of the “question” type queries that are highly relevant to your business for which you rank in the top 10 (or close to it) and for which there are currently no featured snippets. You can get ahead of the game by starting to answer those questions in a way that is “featured snippet friendly” now to get a jump on your competition and potentially capture the featured snippet position as soon as it appears. Still hungry for more information about featured snippets? Have more questions? Want to add your 2 cents?